Hello! It is so good to be back after weeks of being sick. My whole family came down with the most annoying cold ever, and we finally seem to be rid of it. I guess we can be thankful that it wasn't swine flu, but hopefully now that we've all been sick, our bodies are now immune to any other ailment that this season throws at us. Bring it on (but not really)! Since our Saturday out last week had been cancelled due to Mom's cold, we decided that - since she was feeling better - we should get out of the house and have some fun. We had been wanting to see the new movie Paranormal Activity for a while now, and Mom had read that it was playing at the Providence Place Mall in Providence, RI. Now, also in the Providence Place Mall is Johnny Rockets, one of our favorite places to get a hamburger, fries, and milkshake. We wrote down the times for the show, jumped in the car, and headed for the mall. Thankfully there wasn't a lot of traffic, but I was pretty sure that we would be hitting some when we were ready to leave the mall. After some close calls with the clearance bar in the parking garage (that yellow bar looked a lot lower than 6'8" off the ground), and after driving all the way to the top floor of the mall and walking down to the food court, we arrived at Johnny Rockets at 1 p.m.
Yikes! Pretty steep for a couple of burgers. Still, they are really good. The burgers, fries, and shakes have even won local awards! The cashier handed me one of those vibrating disks and told me that when my food was ready, my disk would light up and I could pick up my food at the side counter. I took my disk to the table that Mom had found and patiently waited for our meals. Johnny Rockets is adorable. We've had the pleasure of dining at an actual Johnny Rockets restaurant, which was all decked out in the 1950s burger stand style complete with oldies music blaring and cute white uniforms with paper hats and black bow ties for the staff. The straws come out of that large glass holder that fans them all out when you lift the lid, and the staff - if you eat in the restaurant or sit at the counter in the mall - do these crazy tricks with the ketchup and mustard bottles. It's wild! Also, it seems that the restaurant is offering more things than it used to, such as wraps, salads, and sandwiches. We hadn't been waiting very long before my disk lit up. I took it to the side counter and saw my tray of food waiting for me. Now, I noticed that both burgers (remember, I expected them to be plain) had lettuce and a tomato on them. When I brought the tray over to Mom, she said that she would just chuck the lettuce and tomato out of her hamburger. Problem solved ... or so we thought. I went back up to the counter to get some ketchup from one of their dispensers. When I returned to the table, I found Mom dissecting her burger. Apparently, lettuce and tomato weren't the only things on the burger. I noticed that there was a layer of mustard spread across the top of her patty. As she held the tomato in one hand and wiped the mustard from her patty with the other, I noticed something else - a layer of pickles under the burger. I said, "Ma, there are pickles underneath the hamburger." "THAT'S IT," she cried. "I can't eat this!" For some reason, Mom cannot handle anything on her hamburger. She does not do well with condiments. Weird, I know, but what can you do? You should have seen her holding that tomato with her fingertips like it was a dirty diaper. It was just wiggling in midair when I finally had to tell her to put it down. She was disgusted! After plopping the destroyed burger back together, I took it back to the counter and asked if I could have the burger plain instead since we did ask that they be made that way. The girl behind the counter looked at the burger as if to say, "Who stepped on this?" She threw it out and told me that she would make me another one - plain. I went back to the table to find Mom munching on her fries and shake. I started to eat my burger because I didn't want it to get cold. Unlike Mom, I don't mind condiments on my burger. In fact, I really enjoy them. I was just getting a plain burger so that it would be easier for the staff to make two of the same kind. As I ate my burger, which was absolutely delicious, I found it to be very messy. Perhaps it was vegetables that were making everything slide around, but it was quite hard to eat. As I was stuffing my face, I noticed a hamburger sitting on the counter. I thought that it might have been Mom's, so I told her to go up and ask the cashier if that was her replacement. 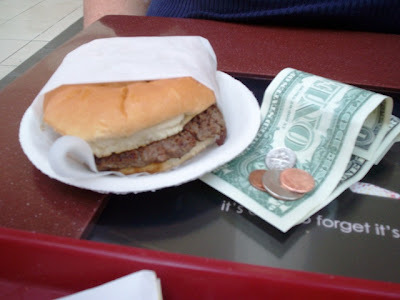 After a few minutes, Mom returned to the table with a beautiful looking hamburger and over $2 in cash. "What is that," I asked. Mom said that, because of the wait, they refunded our money back for one of the orders of fries. How wonderful, considering that the whole burger mistake just may have been my fault. 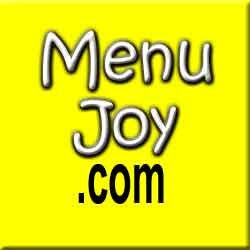 Whenever we've eaten at a Johnny Rockets location, we have always had excellent service. I had already finished my burger, so I ate my fries and drank my shake while Mom had lunch. She said that the burger was perfectly cooked, hot, and tasty. Both sets of fries were thick and had a great potato taste, and the chocolate shakes were to die for. Very thick and cool with a small squirt of whipped cream at the top. Everything was so delicious, it made up for any inconvenience that we had with the veggies in Mom's hamburger. After eating and cleaning up our area, we took the escalator upstairs to the movie theater. We really enjoyed Paranormal Activity, even though we didn't jump as much as we thought we would. When we left the mall (after paying $5 for parking), just like I expected, we got caught in a little traffic. 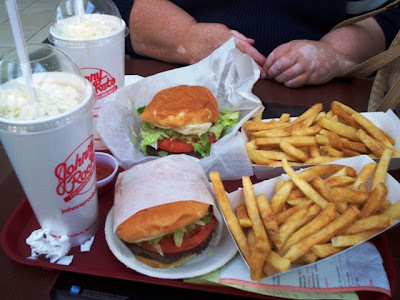 It wasn't too bad, and we'd definitely do it all again just to have another meal at Johnny Rockets. It never lets us down. 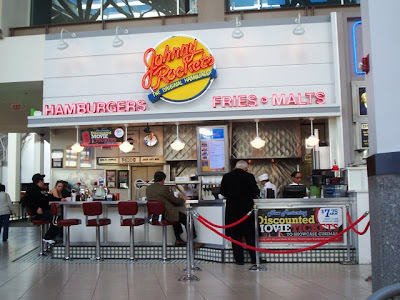 The Johnny Rockets location visited is in the Providence Place Mall at 59 Providence Place, Providence, RI 02903. For more information, call (401) 270-0902.